Our retreat today offered us the opportunity to reflect on the virtue of thankfulness. Thanking God is one way we show that we love Him. But St. John says, "If anyone says, "I love God," but hates his brother, he is a liar; for whoever does not love a brother whom he has seen cannot love God whom he has not seen." In other words, I will more readily thank God for His benefits if I customarily show gratitude to the people around me. A sincere "Thank you" should always be on my lips. I should say it to my fellow Brothers. Then, because I have set gratitude at the core of my character, I will remember to give a heartfelt "Thank you" to the Lord. The adage, " Charity begins at home," implies that the home is the best place to start showing more thankfulness. Let us begin by showing more of it in our Communities and in our homes. Let us express more appreciation for what others do for us. As we learn the habit of thanking people and acknowledging our dependence on them, we will develop a keener sense of our dependence on God. He is our Creator, the Giver of life. Through Him life has meaning and purpose. The past holds no enduring shadows. The future shines now with hope. It is He who covers us with a robe of righteousness, who makes our failures a training ground for spiritual success. He strengthens us until we can serve in His temple forever. He is the One who erases all our pain and dries all our tears and gives us a renewed self to serve as a tabernacle for the soul. Let us indeed give thanks—let us give thanks by giving Him the praise He is due. "It is fortunate that we do not work for men or for our own interests, but for our great Master and the honor of his august Mother." 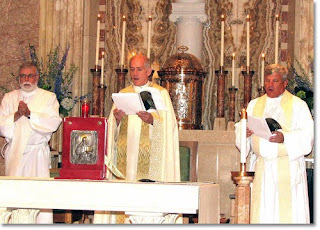 A beautiful and solemn Evening Prayer on July 16 at Our Lady of the Pillar Parish in St. Louis celebrated the official closing of the Metropolitan Tribunal in the Archdiocese of St. Louis investigating the cure of Rachel Baumgartner Lozano, a young St. Louis woman. Rachel was cured of terminal cancer and she, her family and friends believe the cure was a miracle they prayed for through the intercession of Blessed William Joseph Chaminade. Provincial Martin Solma presided at the service; Fr. Bill Meyer, assistant for religious life, gave the homily. Rev. Msgr. John Shamleffer, judicial vicar of the St. Louis Archdiocese, and Rev. Msgr. Jason Gray, vice postulator from Peoria, Ill., participated in the service. Also present were Fr. Jim Tobin, pastor of Our Lady of the Pillar, and Bro. Michael McAward, secretary general of the Society of Mary. Now that the Tribunal is completed, the transcripts will be sent to the Congregation for the Causes of Saints in Rome, which will study the documentation from a medical and theological point of view. 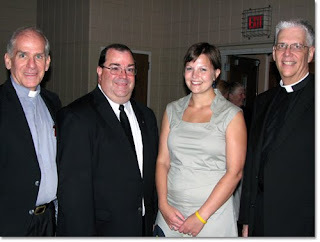 At the reception following the prayer service: Rachel Baumgartner Lozano with Provincial Martin Solma, Bro. Michael McAward, secretary general of the Society of Mary; and Fr. William Meyer, assistant for religious life . 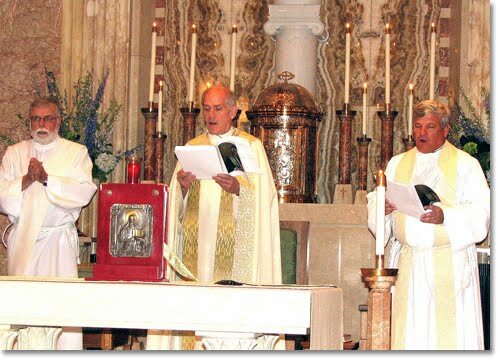 Gerard Quinn, deacon at OLP and notary for the sealing of the documents; Fr. Solma; and Msgr. John Shamleffer, Archdiocesan judicial vicar. "Faith, especially this faith of the heart, is a great gift of God. It is for this reason that we always need to say: “Lord, increase my faith.” God, so to say, easily grants this grace, when we devote ourselves to works of faith. “The just man lives by faith.” What happiness for us if we walk for the rest of our lives on the beautiful pathways of faith, acting only by faith, and living only by faith!" Today's retreat reflections focused on the joy of our religious vocation. We are thankful for so many things. In our Province we must never lose the habit of being appreciative. Fostering an attitude of gratitude is not just feeling but it is expressing thankfulness. "I went to see a good priest who was my Director, and when I asked him how I was to act, he told me: “Our Lord would not have done that . . . Our Lord did this.” Indeed, this was an excellent answer." An abundance of stuff - gathered, ordered, loved and stored - can incubate an attitude of greed. The selfish song of "I, I, my, I, I, my, I, my, my, I, my" can distract us and cause us to forget God, forget our mortality, forget we can't take it with us. "I and my" can cause us to miss the point of life. We are reminded of what Thomas Merton wrote: "Solitude is a way to defend the spirit against the 'murderous din of our materialism." Notice the pronouns in Luke's Gospel passage:"I, I, my, I, I, my, I, my, my, I, my." So said the farmer whose soul was enjoying what his land produced and was wondering where to store it all. Jesus countered: "Take care! Guard against greed. Life doesn't consist in the abundance of possessions." 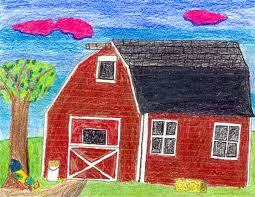 Jesus asks whether we really need to build bigger barns. People who are as invested in barn-building as this rich man don't have time for the kingdom of God, they can't spare the energy for other things, they lose sight of divine priorities and become blind to their growing materialism. It's a warning not to let your soul sink so low beneath the weight of "stuff" that you lose a sense of what's important in life. The rich farmer, poor in heart, worships his desires made possible by his possessions. He adores the idea of his success. His thinking centers on success alone, believing possessions will satisfy his soul. He becomes a barn-building fool. The trouble with possessions is that, if we aren't careful, our possessions can possess us. The "I, me and mine" refrain is a very popular song, especially for those whose philosophy is "The one with the most toys, wins!" Greed makes us forget that we are spiritual beings. We weren't created to be barn-building fools. Let's give thanks for the barn or barns we have, and out of the abundance of what we have, use our resources to sow seeds of love and justice everywhere. Last evening our reflections centered on the Marianist call to conversion. "Let this thought encourage us: let us not be vanquished by our weakness, but let us vanquish it. If our work frightens us, then let the eternal reward promised give us new vigor." One of the themes on which we reflected yesterday was solitude. Christian solitude is simply spending time alone with God. It has great value. 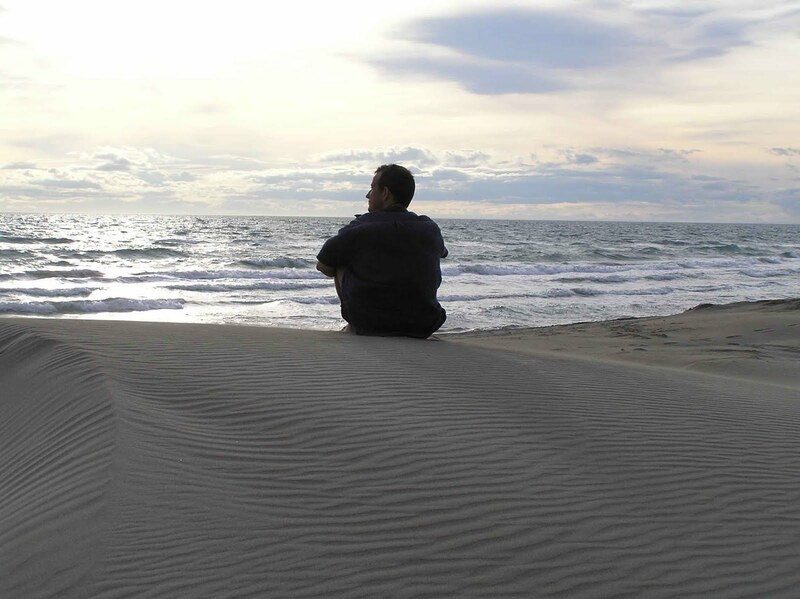 In a world that does not value physical solitude and isolation from others, Christian solitude is essential to our Marianist life. There are, however, some valuable dynamics that occur as we make the conscious decision to spend time alone with God. Remarkably, solitude allows us to develop greater unity, deeper compassion, and renewed perspective. "We are dealing with a jealous God, who will not share our souls with anyone else, since he had no associate when creating us or when redeeming us: the extent of his rights is the foundation of his jealousy"
Yearly the Brothers of the Province take some time to rest, relax and rejuvenate ourselves by prayer, re-focusing and developing our bonds of Community. This summer's week-long retreat takes place at Founder's Hollow. Our theme is "Creating Sabbath Space." "A recent article in Maclean's magazine reported on a study on longevity. What is the secret for a long life? The article summarizes the results of years of scientific research on this question and ends with nine hints for a longer, healthier life. 1. Add simple activities to your day like walking farther than you need to, doing gardening or home repairs yourself, or running around with your children or pets. 2. Try eating off smaller plates to decrease your portion sizes and reduce calories. 3. Limit the number of servings of meat you eat in a week. 4. Drink a glass or two of red wine most evenings. 5. Know your passions in life and take time to enjoy them most days. 6. Take quiet time to relieve stress. 7. Belong to a spiritual community and gather with them regularly. 8. Make your family and your loved ones a priority. Express that through your actions. 9. Surround yourself with friends who have healthy habits and support you in your goals. What's interesting about this list is that it expresses many of the challenges contained in the notion of the Sabbath. Scripture opens with the story of creation. God, we are told, made the world in six days, rested on the seventh, the Sabbath, and declared this day to be forever a day of rest. There is a spirituality of time, work and rest contained in that. According to the theology of the Sabbath, there is to be a fixed rhythm for our days: We are meant to work for six days and then have a one-day sabbatical; work for six years and then have a one-year sabbatical; and, finally, work for a lifetime and have an eternal sabbatical, an eternity of resting in God. Former generations, I believe, took this more seriously than we do today. Remember to keep holy the Sabbath day. Until recently it was clearer that this is a commandment, not a lifestyle suggestion. Sabbath, until recent generations, was a day where ordinary life and ordinary activity were supplanted by different sense of time and activity. What is Sabbath meant to be?" "May you become a pliant and docile instrument in the hands of God for the works he ordains for the glory of the Incarnate Word and his august Mother!" Twenty three students from our Marianist schools traveled to the Life Teen Leadership Conference in Atchison, Kansas last month looking for Jesus. There were over 400 other youth from around the United States looking for Jesus the same week. What we found at Benedictine College filled us far more than we ever imagined. Each day we filled our souls with Scriptures that offered plenty of guidance on such things. We learned that Jesus didn’t come to perfect our lives; He came to lay down His life and take it back up again. When we come to Jesus, and for Jesus, we receive Jesus. When our souls are fed and filled by the work of Jesus, we may still go through difficult times. But one thing we will never, ever be is — empty. Furthermore, when we fill ourselves with Jesus, we find that many of our other cravings in life, such as a need for purpose and meaning, become satisfied, freeing us to view the issues that affect our day-to-day lives with contented eyes and an eternal perspective. So, one last time: What are you hungry for? It’s a great question. It’s a question that goes beyond what you do to quench a midday craving. It’s a question that — if you allow it — tugs at much deeper drives and desires. May we feast on the Food that offers true sustenance for our souls. May we follow Jesus not so that he can meet our needs but rather knowing that he is all we need. "Never, do I think, have I so ardently prayed for you to the Blessed Virgin, as ever since the time that I know you to be ensnared in the toils of self-love and of Mary’s enemy who is ever alert to fan it and to justify it by all manner of illusions. Watch and pray." To be honest when I first began this form of prayer, I expected to spew lots of negative experiences and have to search deep for the good stuff each day. Surprisingly, the opposite occurred. Each night I was overwhelmed by the countless moments of blessings and often had to hunt and sometimes never find unpleasantries. Thankfulness, counting your blessings, is powerful! "You meet with contradictions; well, who does not experience them, particularly in great enterprises?" Sunday's Gospel allows us to reflect on the great prayer, the "Lord's Prayer. "This prayer has been offered up for over two thousand years. It links us with a host of great Christian thinkers. We all have prayed this prayer, but how many times have you recited the "Lord's Prayer" with your mind and your spirit on full automatic? You just begin and end and recite the whole prayer without a single thought. The words are so familiar that we can be on "cruise control" for the entire prayer. It is amazing and quite amusing how we have convinced ourselves that God hasn't yet caught on to the difference between our expressions of genuine spirituality and our automatic, rote readings of the "Lord's Prayer." Likewise, Jesus encourages his disciples to go continually into God's presence in prayer. But God, delights in our clamorings in prayer all hours of the day and night. Reading the Word and praying to God are faith mantras we must exercise on our own, but we must also read and pray, praise and question, in small groups. We need that communal, cellular contact with faith every day of our lives. Part of our spiritual freshness depends on opening up our hearts and spirits to the sounds and sights of others. We need to be spiritually connected to one another. It is a good "sign of the times" that group prayer meetings continue to be popular. Last week a group of our students gathered together and reflected on the upcoming Sunday's readings. These spontaneous meetings do help stay spiritually connected. All of us struggle to keep our faith fresh and vital. We can develop favorite ways, personal mantras, that aid and sustain us in this task. We might employ techniques as ancient and honorable as fasting, praying the Rosary, praying the Magnificat daily, daily Mass or Adoration. If you pray, or used to pray, or try to pray, or want to pray... take a look at the first and third readings for Sunday and see how they speak to you - and prepare to hear them proclaimed on the weekend. "We repeat and confirm what has already been said that the second object, zeal for the salvation of souls, proceeds directly from the first with which God has inspired us, namely, with his grace, to imitate Jesus Christ and to offer ourselves to Mary as her most humble servants and ministers." The video was made over a year ago but was only recently circulated on various websites. "Jesus deigned to assume a form resembling ours, and we should in turn shape ourselves to his likeness, conform our morals to his, our inclinations to his inclinations, our life to his life." The whole Family of Mary is mindful of Blessed William Joseph Chaminade since the investigation of the miracle attributed to him has been completed. His presence is particularly felt in Bordeaux, France. 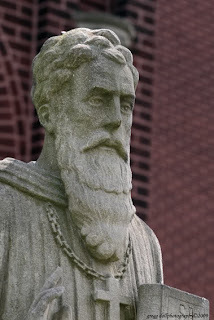 The Marianists have held a presence in this area since the earliest days of our Founder. Two of our Brothers are attending the International Horizons program for Marianists this summer. Brother Peter and Brother Benjamin have met with other Marianists from around the world to capture the spirit and charism of our Founder. The Horizons participants were able to tour Blessed Chaminade's room in Bordeaux, France. Here in this video, Fr. David Fleming, former Superior General of the Society of Mary, gives a brief tour of Blessed Chaminade’s room in Bordeaux, France. 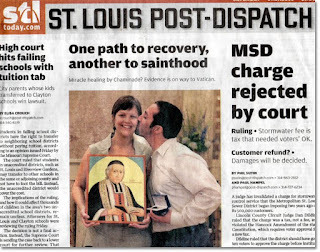 With the recent closing of the investigation of Blessed Chamnade's miracle in St. Louis we are in exciting times. We are able to share with our Brothers their experiences of Bordeaux and continue to pray for the Canonization of Blessed Chamiande. "God in his goodness vouchsafes to strew our labors with trials and tribulations. Blessed be his holy name!" 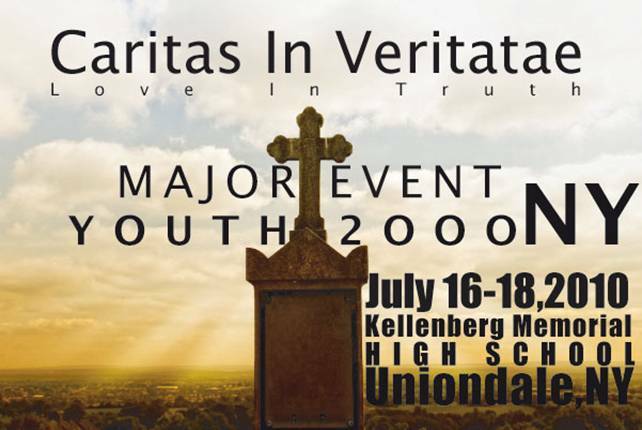 Hundreds of young people were called this weekend to explore their vocation during the Major Event of Youth 2000 at Kellenberg Memorial. The focal point of the weekend was the worship Jesus in the Holy Eucharist. The heat and humidity did not affect the enthusiasm of hundreds of the faith-filled. This grace-filled weekend began with the exposition of the Blessed Sacrament under the outdoor tent. All events prayerfully took place in the presence of the Eucharist. During the weekend we celebrated the Eucharist, prayed the rosary to promote a devotion to Mary, listened to inspiring stories, danced, sang and had many great games of Frisbee. "I shall make the most strenuous efforts to remain in the state of grace, and try to sanctify each day as if it were the last one of my life." Yesterday four novices from St. Anne's Novitiate of the Little Sisters of the Poor professed vows of poverty, chastity, obedience and hospitality. Bishop Caggiano was the principal celebrant of the Mass. After the Mass the newly professed received their "obedience" which gave them a Province to which they would go and a Community in which they would work for two year. Above two Provincials announce wjere the newly professed will be living and working. The Little Sisters with whom the Marianists have been associated for many years care for the elderly poor. A St. Louis girl somehow survived a rare and deadly cancer. Doctors can't even explain how she is alive today, and now the Vatican is investigating her case as a possible miracle. News-4's Maggie Crane explains how it happened. Rachel Baumgartner Lozano was diagnosed with a rare and deadly cancer during her sophomore year in high school. It was 1998, and chances of beating the tumor growing on her spine were slim. "It was shutting down my body," Lozano says. "I had to have emergency surgery. Then I went through a year of chemo and radiation." That killed the cancer, but it came back -- with a vengeance. "I had a life-threatening bone marrow transplant that I almost didn't survive, and then about a year and a half after that, (the cancer) came back between my heart, lung and spine," Lozano says. This third recurrence was bad news. The cancer was in a spot too dicey to operate. Two years went by. Doctors managed her pain but knew she was terminal. "In both cases, when a patient has a recurrence, survival is typically measured in days to weeks," Dr. Robert Bergamini, Director of Oncology and Hematology at St. John's Mercy Children's Hospital, says. Dr. Bergamini treated Lozano throughout her bout with cancer and continues as her doctor today. Rachel was beating the odds -- hanging on, even while the cancer grew again. "I just wanted to do something each day that meant something to me, whether it was talking on the phone to a friend, reading a book, going on a trip," Lozano says of those days. "I just wanted to do something each day that was meaningful, so that if it was my last day then I wouldn't be regretful about anything." Finally, the decision came to operate -- the last resort to try to save the then 21-year-old girl. "(The surgeon) took out a tumor the size of a small football and sent the whole thing off -- in tact -- to the pathologist," Dr. Bergamini says. "And two days later, the pathologist called and said 'this is all scar tissue.' And it was just 'do you have the right patient?!' I said, 'what do you mean it's all scar tissue?' He said 'it's all scar tissue, it's dead.'" What doctors had tested and were sure was cancer, suddenly was not. And that is what the Vatican is investigating as a possible miracle. "Medically, you just kind of go this shouldn't have happened," Dr. Bergamini says. In 27 years and hundreds of patients, Dr. Bergamini has never seen a success story quite like Rachel's. "I define a miracle as something that is unexplainable by common medical practice -- accepted medical practice -- and Rachel certainly falls into that category," Dr. Bergamini says. And that makes Rachel wonder if prayer and a certain priest played just as big of a role as modern medicine. Daily, she asked Blessed Chaminade, a founder of the Marianist Order, to intercede on her behalf -- to cure her of the deadly cancer. "That energy was so important to keep me going, and it was one of the only things that gave me hope too," Lozano says. Rachel and her doctors have spent six years testifying in what amounts to a Catholic court case, proving that modern medicine alone didn't cure her. The Pope will ultimately decide if Chaminade should become a saint. 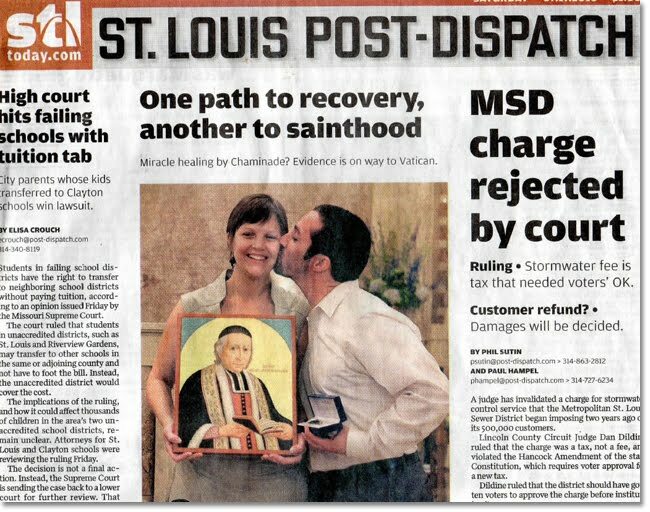 If the Pope agrees Rachel's cure is miraculous, it would be only the second miracle in the Catholic Church from St. Louis. The last one happened in 1886, making it hard to overestimate what that would mean not only to the St. Louis faithful, but to Rachel. "I still think I'm a miracle either way!" she says. Friday night, Vatican investigators will officially close Rachel's case during a 7 p.m. prayer ceremony at Our Lady of the Pillar -- Rachel's church. Then, the miracle investigation goes to Rome where yet another panel will review the case. If it passes the panel, the case gets sent to the Pope for review. His decision could take months or even several years. Rachel married Gabe Lozano and continues to use art as her own form of therapy. Her work is gaining recognition around St. Louis. She just had her first gallery showing. Rachel is studying to get her Masters in art therapy and counseling -- two things that helped her get through her battle. Rachel is also an inspirational speaker -- both locally and nationally. The last certified miracle to be performed in St. Louis happened at the Shrine of St. Joseph in 1886. The miracle lead to Blessed Peter Claver becoming a saint. According to the Missionary Sisters of St. Peter Claver, the saint healed a dying man after that man prayed to Blessed Claver and kissed a relic of him. Servant of God: A diocese, parish or organization asks the bishop to open an investigation. The Vatican grants that person title of "servant of God." The diocesan tribunal hears witnesses and testimony on heroic Christian virtues. So, the term "Servant of God" describes someone at this stage in the process. Venerable: The postulator presents acts and documents to the Congregation of Causes of Saints in Rome. After favorable judgment and papal approval, the candidate is declared "Venerable." Blessed: After a miracle attributed to the intercession of the "Venerable" has been investigated and accepted, the pope decides on beatification. The Venerable is now titled "Blessed." Saint: After a second miracle is attributed to the intercession of the "Blessed," the pope may then declare the Blessed a "Saint." One of the participants in the next World Youth Day is 500 years old! Well who? Not who, what? The 500 year old monstrance of Arfe will be in one of the principal events of World Youth Day to be celebrated in Madrid. The vigil with the Pope on Saturday night, August 20, 2011, will end with Eucharistic Adoration where this Spanish master work will be utilized. This monstrance is recognized as the one used in the Corpus Christi procession celebrated each year in the streets of Toledo. It measures approximateky nine feet and is made of gold and silver. The Arfe's monstrance dates from 1524 and claims that it is "the greatest example of Spanish silverwork of all time" and underlines that "the occasion of bringing it to Madrid is well worth the effort." If there were one story in Scripture that has bothered me a bit, it is the story of Martha and Mary. We have these two sisters. 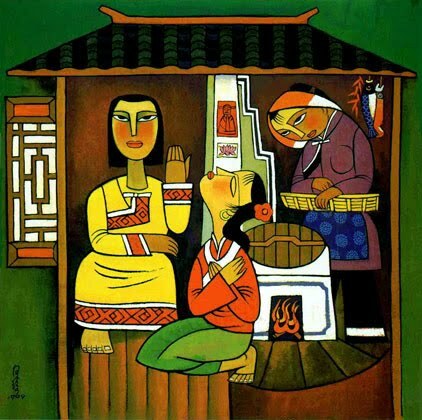 Martha takes the opportunity to welcome Jesus into their home. Mary wastes no time to sit at the feet of Jesus and just hang out on His every word. So what is active Martha to do? She could sit down and let the dinner boil over? If she settles down at the feet of Jesus, who will take care of serving? Who will take care of the meal? Nothing will get done. Then Jesus sets everything straight. He tells her that she frets and bothers about too many things. Oh, and your sister, Mary, has chosen the better part. She just sits around doing nothing. Wouldn't you like to have been a mouse in that house? How would Martha have answered? Maybe she said, "I'm tired. You two set the table and cook the dinner. I'm just exhausted and unappreciated." But Jesus sees it all developing and notices the "woe is me" in Martha. He picks out her resentment. He sees how her little ego is tweeked. He is able to notice how we sometimes have a "binocular look" at how little others seem to accomplish while we are "slaving over a hot stove." The real story of Martha and Mary is not about the value of work, but about the way we work. Actually, there is a Martha in all of us. And don't forget there is a Mary too. The challenge, for all of us, is letting them get along. When we sit down before God, we must learn to rejoice. And when we go about our daily chores of life, we must work with a certain joy of the moment. "God is strong for our defense; but we must desire to be defended. Your salvation and your peace are in his hands; ask for them." A few days ago I received an email from a friend that told me about the health of the former secretary at my Marianist high school. The email told me that the chances of this woman making the night were slim to none. So, I spread the news to people and told them all to pray for her. The next day when I returned from work, I saw that I received another email from my friend. I said to myself “this is it.” “This email was going to tell me that the woman had passed away.” But when I opened it, it had told me that she had survived the night and that the doctors didn’t know how it had happened. It said that she had regained consciousness and that she was able to recognize family members. Prayer is certainly powerful. It an important thing in our lives. The more we pray, the closer we get to Christ, and that is the ultimate goal. When we become closer to Christ, our spiritual life grows and we ultimately become better people in the eyes of God. There are many ways we can pray. We can pray the Rosary, pray at Eucharistic adoration, pray the Liturgy of the Hours, pray those prayers we have known since first grade, and there are so many more ways. The more we pray, the closer we become like Christ. The closer we are to Christ the better people we become. "The Lord afflicts us in diverse ways; let us profit by all our tribulations. Let nothing shake our confidence and fidelity; it is amid contradictions and tribulations that the works of God prosper, are purified and strengthened." "In the performance of my duties, I shall be guided by motives derived from religion, never by vanity or mere habit." 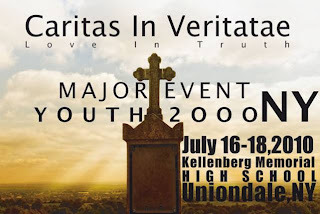 A great summer event happens this weekend at one of our Marianist high schools. It runs from Friday to Sunday. Usually 400 teens attend the summer main event. A very good line-up of speakers. If you have some time, stop by and enjoy part or all of the YOUTH 2000 main event. "When Rebecca of old, the mother of Jacob, wished to obtain the blessing of Isaac, she clothed her beloved son in the garments of Esau. In like manner, Mary is unceasingly striving to clothe us in the semblance of Jesus Christ, by endeavoring to inculcate into our hearts the thoughts and sentiments of Jesus, and to bring us to a realization of our title as Christians, that is as disciples and imitators of Jesus Christ." The Life Teen Leadership Conference has come to an end. It is the mission of those who attended to take what they have learned and begin to live it. In a way they must, "Believe what you read. Teach what you believe. Practice what you teach." The Benedictine College Bookstore is selling out on one new product. This week's Life Teen visitors were able to secure one new item for Mr. Harris. Here Jay Valentine, Sean McVeigh and David Mulry present a t-shirt to moderator Mr. Harris. A final moment at the liturgy caught Sean Kiley awake to the camera. Above is the Kellenberg Memorial Life Teen group. Thomas Werring served as crossbearer at the closing Liturgy for the Life Teen Leadership Conference. The Chaminade Life Teen group pose for a final picture. "Wherever you may be, honor the perfect moderation of the august Mary, whose name you bear and may the whole universe know that we are true children of Mary, especially by our purity." On April 12, 2010, one of our graduates renewed her vows as a Sister of St. Francis of the Martyr St. George. Sister M. Pauline joined us at the Kellenberg Memorial High School reunion last month as her class celebrated their 5th year since graduation. While the group picture is small Sr. M. Pauline is the fifth from the left. We give thanks to the Lord for the gift of her vocation! May the Father and the Son and the Holy Spirit be glorified in all places through the Immaculate Virgin Mary! 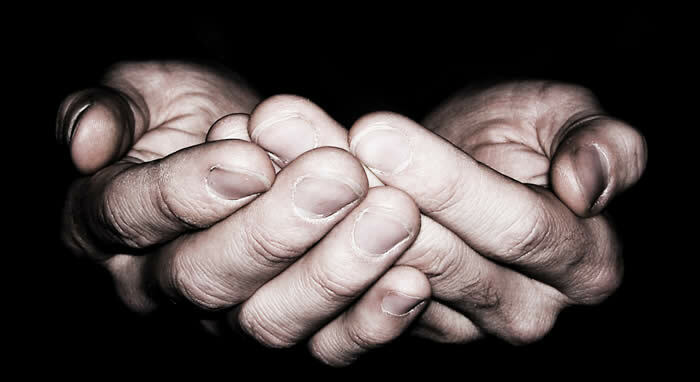 "It is humility of the heart that the Lord demands of us. “Learn of me because I am meek and humble of heart.” I look upon humility as one of the first fruits of faith of the heart. Humility makes progress in proportion to growth in faith." "The spirit of the Institute is the spirit of Mary: this explains all. If you are children of Mary, imitate Mary'"
Last week when we traveled to Kansas for the Life Teen Conference it was quite funny how some poeple packed. Some of our students pulled out of their arriving car with an average sized luggage. It was easy to carry and store. When we arrived at the airport we begin checking the not-so-average pieces of luggage. The largest among our luggage was close to 50 pounds. So, how much do you pack when you are going away? Some people gather their needs and place them in a backpack and off they go. Others get their suitcase and can barely fit the essentials. But the Lord tells us to travel light. "Carry no money bag, no sack, no sandals; and greet no one along the way." The Gospel encourages us to bring nothing along that will weigh us down or hinder our task. The fact is we all have a lot of baggage that hinders us from the more important work of spreading the Good News. Too many parents barely know their kids because they work long hours at jobs to pay for a life style that is too expensive. On top of all this we add endless projects and pursuits that keep us running all over God’s green acre. Perhaps good in themselves, they become too much of a good thing and we end up barely knowing the first people we are to evangelize, our children. "Perfection consists in putting off the old man and putting on the new. Now, what is the old man? It is our corrupt nature, which we have received from our first father as an inheritance. This nature must be annihilated, and put off entirely to make room for the new Adam, that is, Jesus Christ." Sunday's Gospel said, "At that time the Lord appointed seventy-two others whom he sent ahead of him in pairs to every town and place he intended to visit." This pericope from Sunday's Gospel selection shows Christ's plan for Evangelization. It is not just some sort of haphazard, shoot from the hip program where he wanders about aimlessly. Rather the Lord had a plan to visit specific cities at specific times. And, in order to prepare for his visit, he sent an entourage ahead of him. Their goal was to scout out the scene and to prepare and arrange all the necessities for his visit. The Scriptures say, "The harvest is rich but the laborers are few; so ask the master of the harvest to send out laborers for his harvest." Therefore before any work is to be done there must be prayer. Before we ventured with 24 of our students to the Life Teen Conference there was prayer. Many parents, teachers, students and friends were praying for us while we were there. Each day the Marianist Community made a special intention at Mass for the Life Teen Conference. In fact, before any effective evangelizing there must be prayer. It is with prayer that we are sent, not by man, but by God. So step one for effective evangelization is to have a praying community asking for laborers. Habit one: Pray!